First of all, we need to start giving names to things. 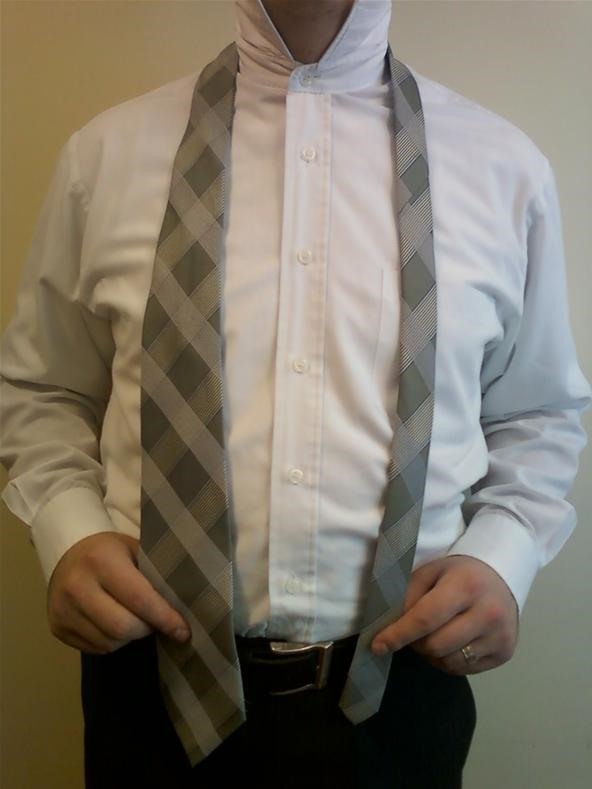 Most ties (probably yours, too) are tapered. 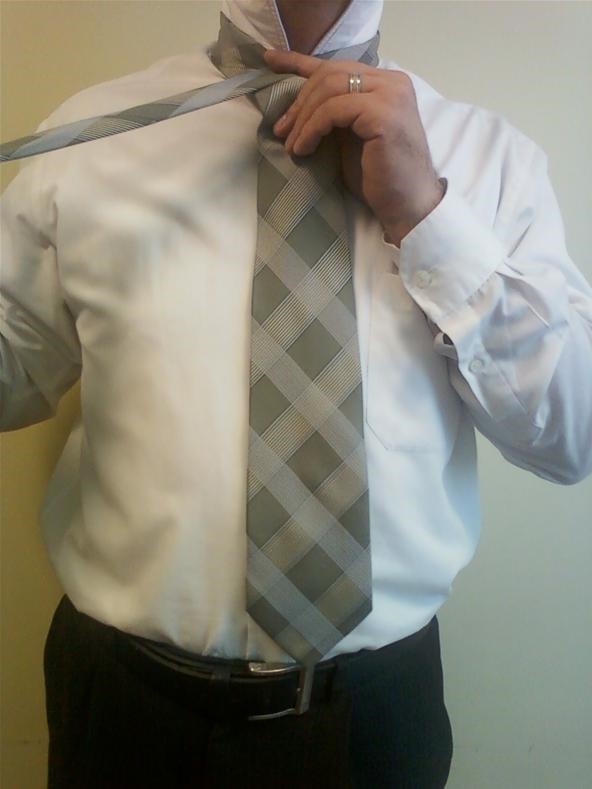 We will refer to the two ends of the tie as the wide blade and the narrow blade. 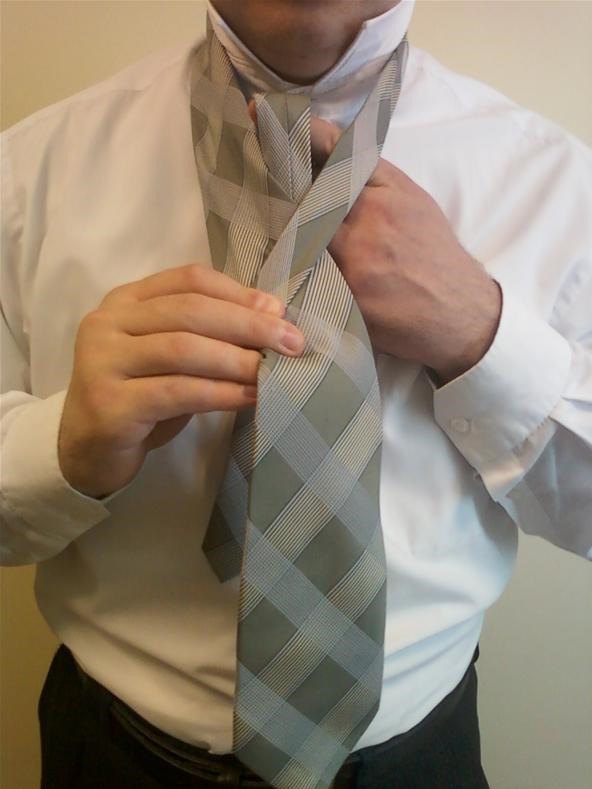 When describing how to tie a knot, you have to think in terms of a triangle with three positions—left, right and center. 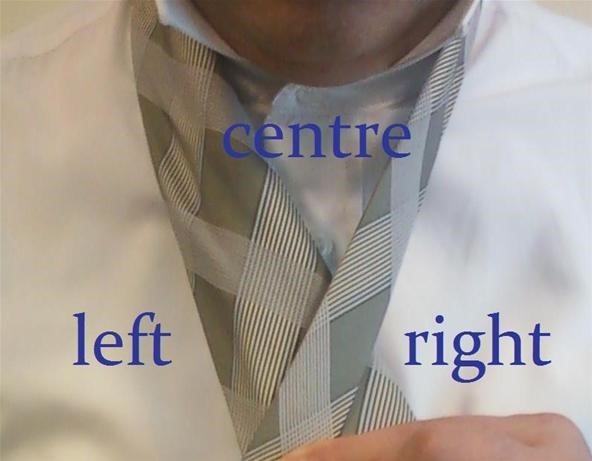 Left means to the left of the knot, or down and to the left. Same goes for the right. 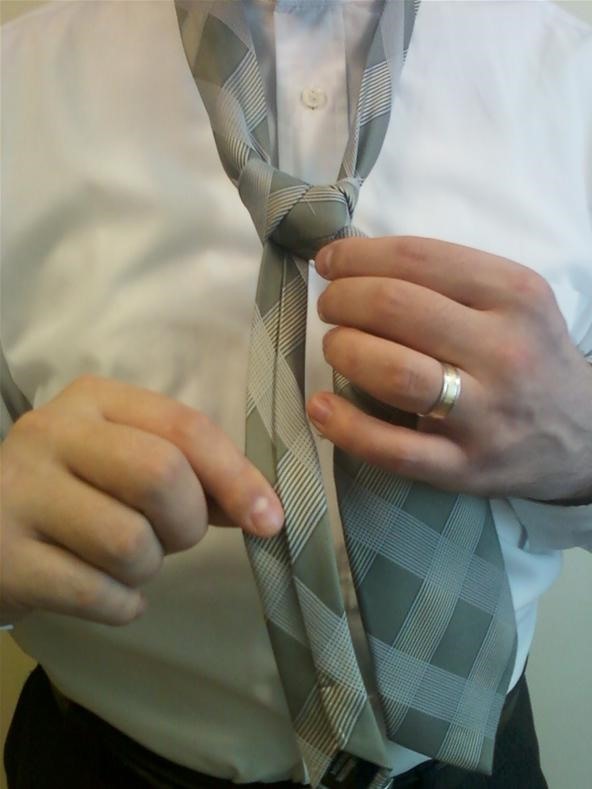 Behind the knot is the gap between the two lengths of cloth leading from your neck to the knot—this is the center. All of the image views in this article are what it would like in your mirror. 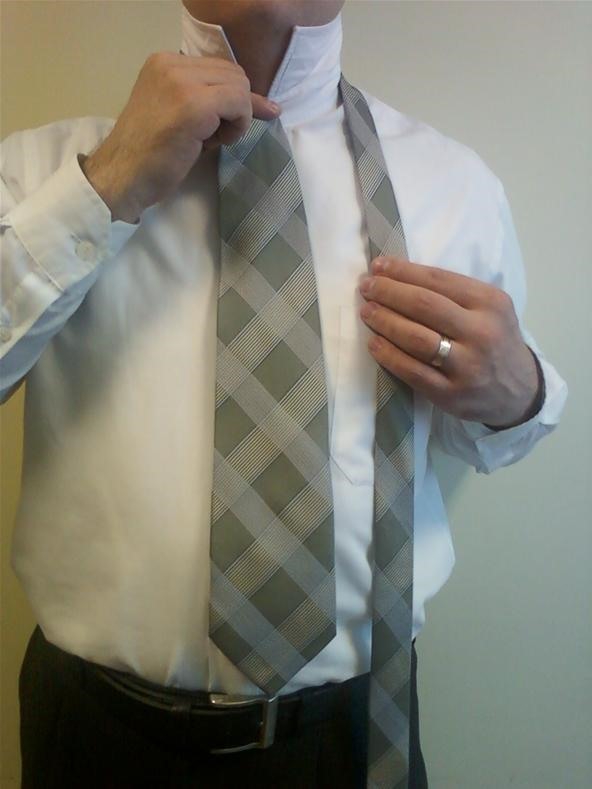 Usually, when tying a tie, you have the wide blade over your right shoulder and the narrow blade over your left. 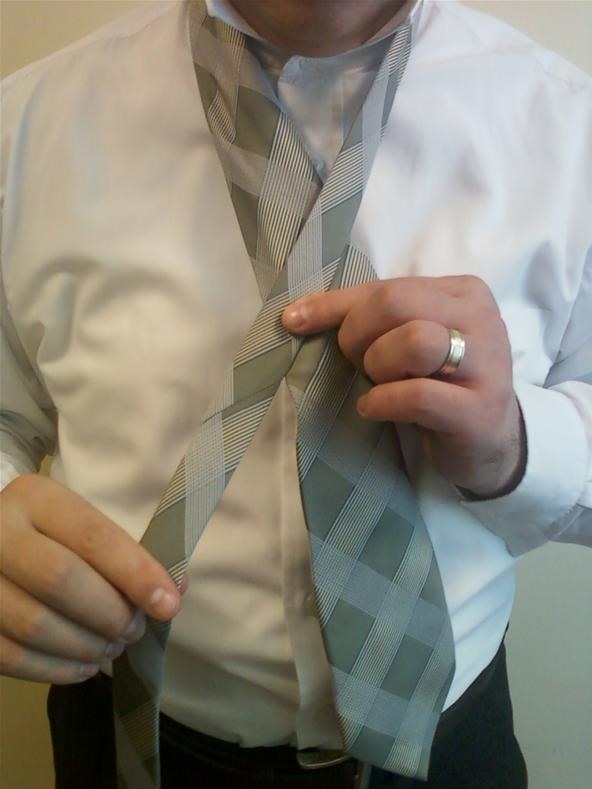 However this is a "reversed" knot, so it needs to be the other way around. Have the narrow blade over your right shoulder and the wide blade over your left. 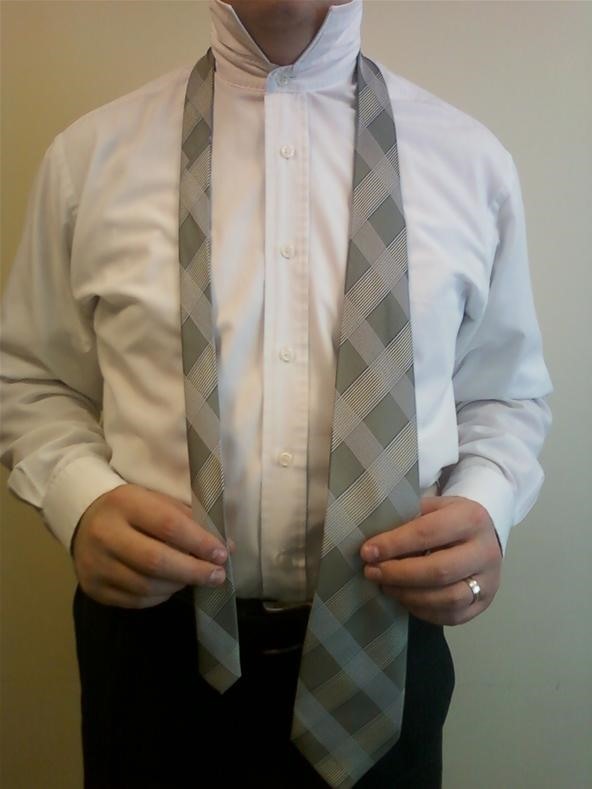 Also, we're going to tie this tie right-side up, meaning the side of the tie with a seam is facing down as you drape it over your shoulders. 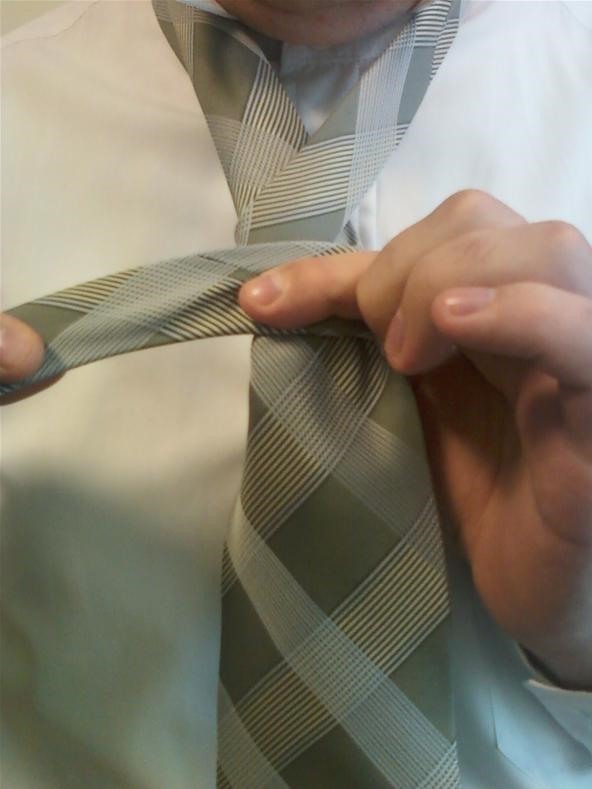 Now, you're probably used to tying a knot with the wide blade and not the narrow blade, so you might have trouble judging the length. 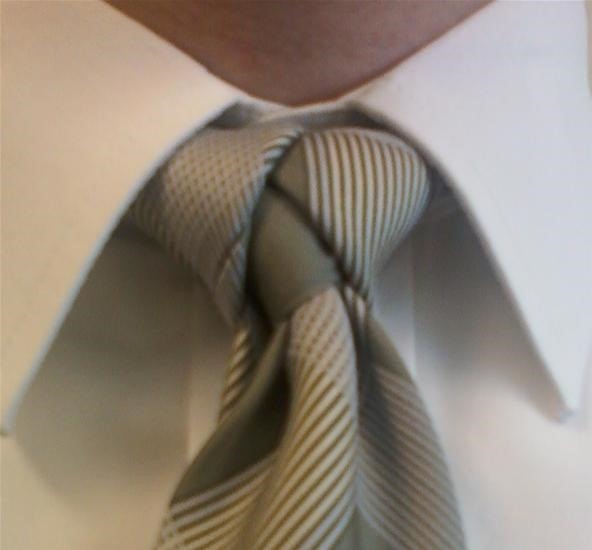 I'm going to give you a couple of tips for that here; if you like you can skip these tips and come back later once you've gotten used to the knot itself. 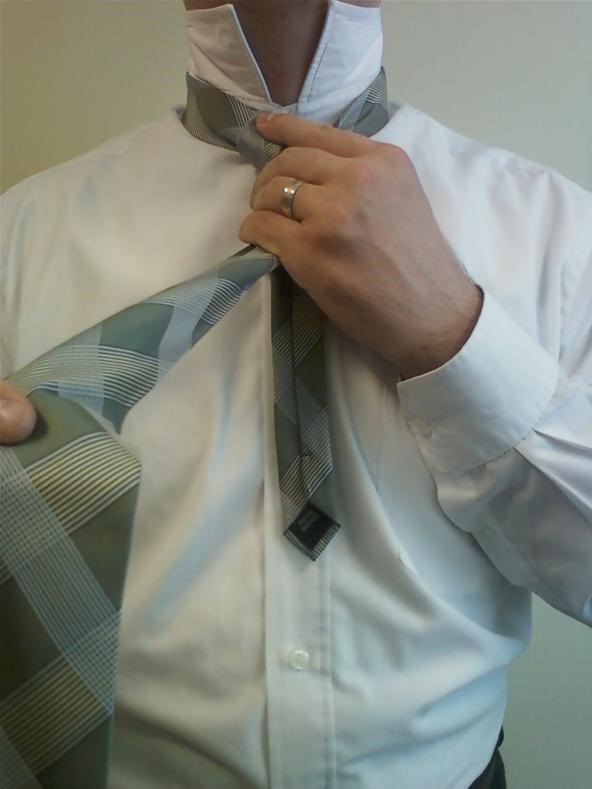 Now, bring the narrow blade over the top so that it's wrapped around your neck at the usual tightness for a tie. Find where the narrow blade crosses the wide blade and hold it between your thumb and forefinger. You will tie the knot with the rest of the narrow blade from this point. 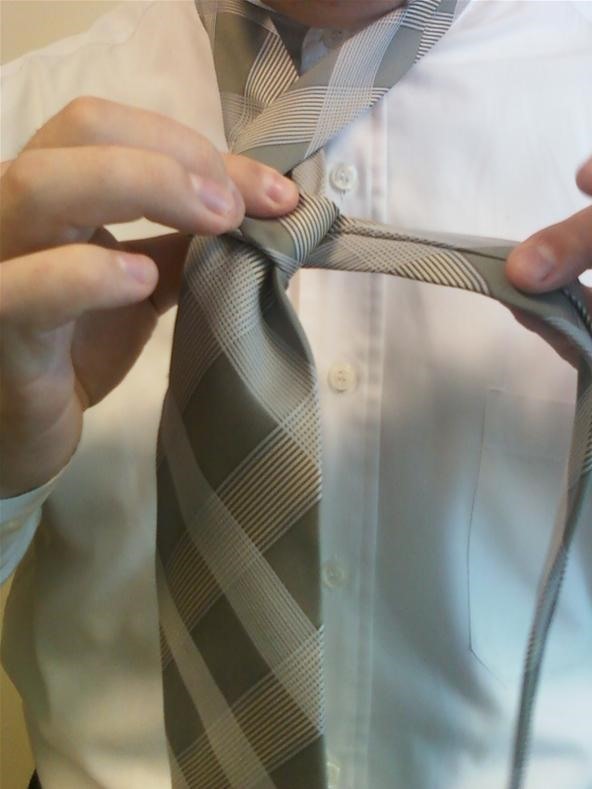 When you're tying the knot, you don't need to worry about the wide blade, because that's the end you'll be pulling to bring the knot up to your neck. Step 1 Place narrow blade over top of wide blade. Step 2 Fold and pass it up through the center. Step 3 Pull it down over to the right. 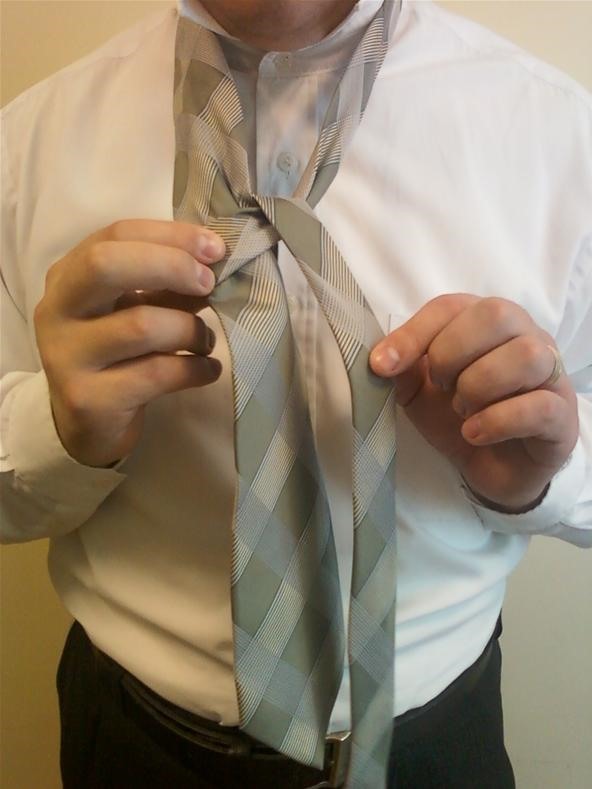 Step 4 Fold and pass behind the knot, not through center, but around to the left. Step 5 Fold and pass narrow blade back up and towards yourself. Step 6 Tuck it down through the horizontal loop created in Step 4. Step 8 Pull wide blade to tighten around your neck. 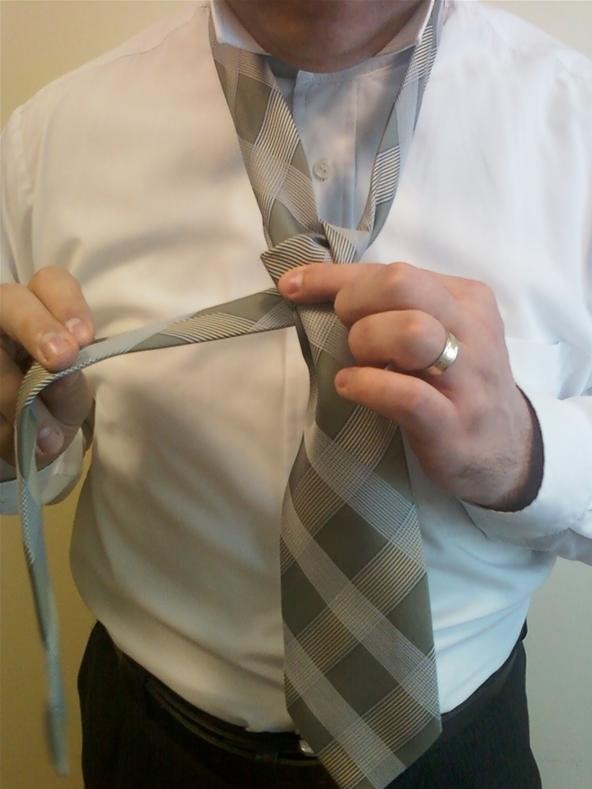 If you look in the mirror after tying the Atlantic, you can see you basically have two loops above the knot, one to the right and one to the left. 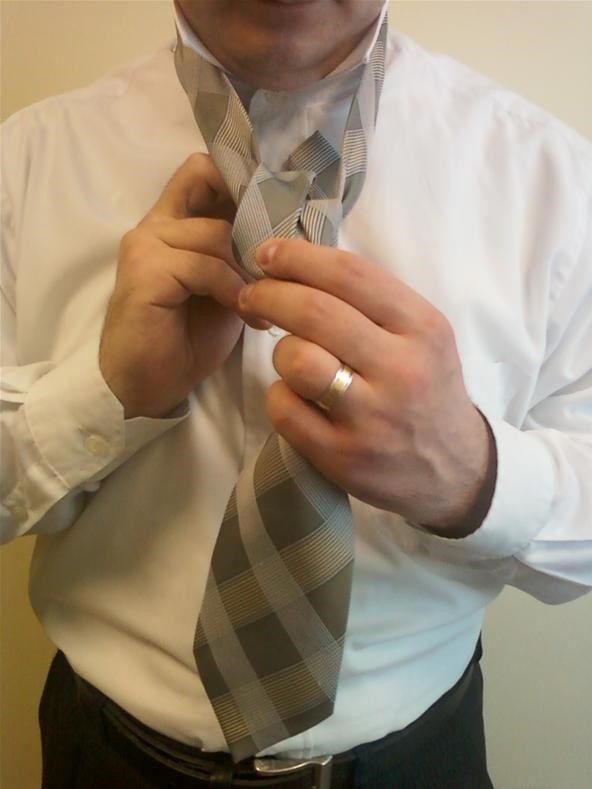 A variant on this is a tie I like to call the Bosphorus tie, which gives you a third loop around the knot itself. Just insert the following extra steps after Step 1 and before Step 2 above. A. Fold and pass it behind the wide blade to the right. B. Fold and pass it over again to the left. 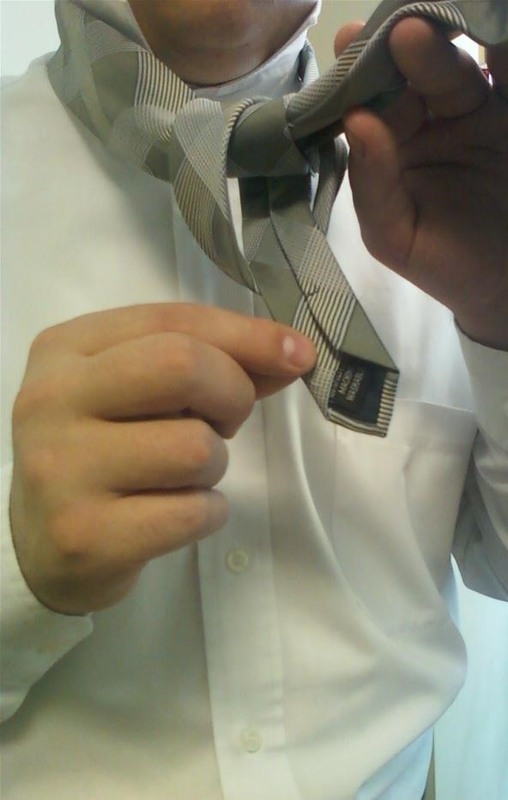 Ooh, that suits you, sir! 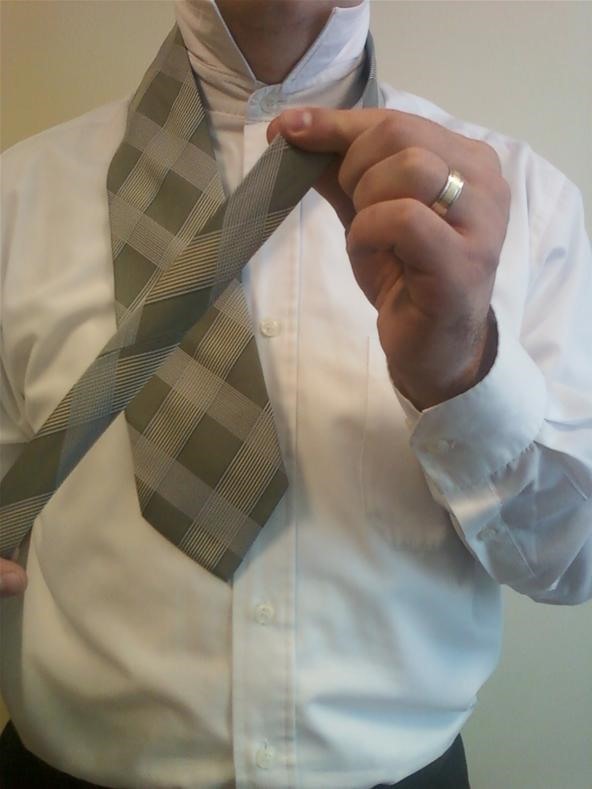 Technically speaking, the Atlantic is a reversed Nicky, and the "Bosphorus" is a reversed St. Andrews knot. 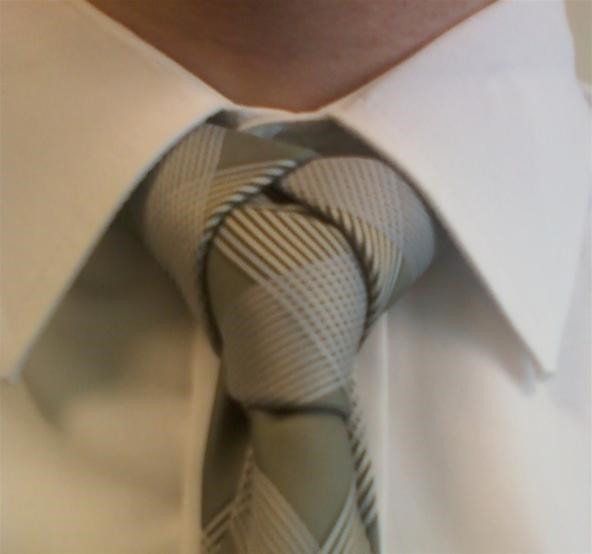 An excellent webpage that discusses all kinds of knots in more detail is Thomas Fink's website.